The famed downtown New York City music venue CBGB has been closed for seven years now, but its legacy lives on through the many iconic and enduring punk and New Wave acts who got their start there in the 1970s, among them the Ramones, Blondie, the Talking Heads, the Dead Boys, Television and Patti Smith. But CBGB is more than the just artists who went on to fame and fortune: it's also the story of the late Hilly Kristal, who originally started the club in 1973 as a roots venue ("country, bluegrass and blues") and gave these and other up-and-coming artists their big break. Now the story of the Lower East Side club and its founder is being told in a new movie dramatization, CBGB, directed and co-written by Randall Miller. Among the actors are Alan Rickman (Hilly Kristal), Malin Akerman (Debbie Harry), Taylor Hawkins (Iggy Pop), Mickey Sumner (Patti Smith) and Rupert Grint (the Dead Boys' Cheetah Chrome). The movie will premiere in New York City at the CBGB Festival on October 8th before opening nationwide on the 11th. Miller tells Rolling Stone that the project came about a few years ago, around the time he was working on a movie about the late Dennis Wilson of the Beach Boys. "Jody [Savin, the movie's co-writer] and I had both had been to CBGB and loved the scene, what CBGB stood for back in the day," he says. "We were like, 'What about a movie about a time and a place?' As you peel it away, you find out more and more about the story and the people. We probably interviewed 100 different people involved in CBGB and we realized there was this great story to be told about Hilly, how he started it." One of the challenges for the production was going for authenticity, including the physical setting of the club. 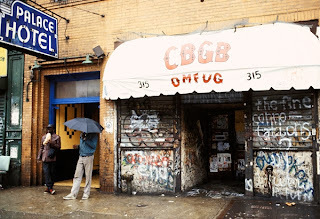 Fortunately, some of CBGB's actual fixtures, such as the bar, the front doors, and the infamous urinals were stored in Brooklyn and were used on the set. "You know those medical technician gloves?" says Miller. "There were guys who were like, 'Man, I'm not touching those toilets.' [Laughs] We had many items in the movie – [Hilly's] desk is in the movie. When Alan sat down and he's acting in the scene . . . and he opens one of the drawers, there was a menu to some deli around the corner from CBGB, and it had his order of the day circled. That was really cool." While the movie is headlined by well-known actors such as Rickman, Akerman, Ashley Greene and Johnny Galecki, it also features several newcomers portraying musicians who have a connection to the club, including Talking Heads' David Byrne and Television's Tom Verlaine. Making his film debut is Foo Fighters drummer Taylor Hawkins, who plays iconic wild man Iggy Pop. "He's actually a huge Dennis Wilson fan," said Miller. "Because we had auditioned him a couple of times, we said, 'You know what,you have the body type of Iggy Pop. Would you ever consider doing that?' And he was like, 'I don't know if I could.' Then we worked with him, and he was pretty amazing. He lost 20 pounds and ripped his body, got really into shape because he wanted to have that Iggy Pop, really strong abs-and-muscles kind of look. Iggy was pretty crazy onstage, and Taylor's got that energy. He was on set for days without a shirt on, wearing little low-cut jeans. That is just what he was. I'm really excited for people to see that." In an example of ironic symmetry, actress Mickey Sumner portrays punk poet Patti Smith. Sumner is the daughter of singer-bassist Gordon Sumner, better known as Sting, whose younger self, played by actor Keene McRae, is depicted in the movie with the Police. "We were having a hard time figuring out who can play Patti Smith, because it's a very specific look and a very iconic person," says Miller. "It turns out Mickey is a tremendous Patti Smith fan, loves her writing. She actually asked permission from Patti to play her. She looks amazing in it. She really got it down." Another challenge for the movie was getting the rights to the music. In the end, about 65 songs were used. "To me, there were three pieces musically," says Brad Rosenberger, the film's co-producer and music supervisor. "There was what came before [the Stooges, Velvet Underground, Count Five]. There was what has come out of it that has become iconic [Blondie, Talking Heads, the Ramones]. And then there were those bands that people at the club knew – Tuff Darts and the Laughing Dogs. We got a little bit of everything." The accompanying soundtrack features 20 tracks, including a whimsical song Kristal recorded himself called "Birds and the Bees." One noticeable omission is music from the Ramones, although the soundtrack features the late Joey Ramone's "I Got Knocked Down," from his posthumous 2001 solo record. "We showed the band or representation the film, and for whatever reason, they couldn't seem to go for it," says Rosenberger. "The Joey Ramone side – they were fine. There was no animosity. I personally thought it was a lost opportunity." The soundtrack also features a re-recording of Blondie's "Sunday Girl," which originally appeared on the band's 1978 album Parallel Lines. "We've been talking to them for a while because they're important to the film," says Rosenberger. "I was talking to their manager and told him what we were looking for. And he said, 'The band actually just went in and did this [re-recording] – would you be interested in it?' We listened to it – I thought it worked great. It's amazing [that] 40 years later, you would never know that was a new recording." As for the movie, director Miller says those who know the club probably aren't familiar with Kristal's story, so CBGB would still be a discovery for them. "I think there’s people who are huge fans of all these bands but they don't understand that it was this down-on-his-luck guy who started it all. He was having a really hard time, starting this club and not making any kind of money. He was like, 'Oh, come on in and drink for free, come on in and play, I'll give you everything that I have.' There was something really heroic abut that."